The LPGA Championship is over. 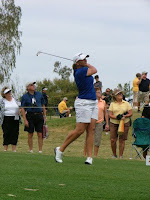 Over is the sense that the 2009 edition has been completed with a most unlikely champion - 22-year old rookie Anna Nordqvist of Sweden who became the first player since Se Ri Pak to win in her first attempt at a professional major. Nordqvist plowed out three birdies on the last four holes over the farm field that is Bulle Rock just when it looked like the wheels may spin off. Over in the sense that LPGA’s championship will no longer be known as the McDonald LPGA Championship present by … pick your own corporate brand. The LPGA is taking over the whole championship driver, putter and all the bunkers. As of this minute we have no idea where next year’s event will be played or where the purse will come from. The LPGA, as you may know, is in somewhat of a hurt concerning the who, what, where and when part of the tournament schedule. In light of all that here are a few observations from this year’s version and what’s up for the future. The move from Bulle Rock in Havre de Grace Maryland is probably a good one. 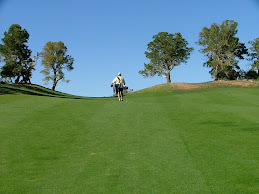 Middle-of-Nowhere, Md is just five miles up the street from the golf course. When, during Sunday’s telecast by the Golf Channel we were provided with an overhead shot of the clubhouse and surrounding area and received the comment from Brian Hammonds that the crowds were good just as they always are, I had to restrain myself from immediately calling my optometrist. If they had held the shot for ten more seconds, I believe I could have counted all the fans. And they were not all on the course watching the leaders. There were probably not more than 400 spectators following Nordqvist and Wright (not Mickey) in the final group. Yes, it sure seems like it’s a good idea to move the tournament out of the Maryland farm country. Michael Bamberger at Golf.com has an interesting take on this. The sparse crowds drew the attention of Kevin Cowherd of the Baltimore Sun, apparently one of the few remaining daily newspapers with a golf writer. Cowherd focuses on one of the LPGA’s problems – a lack of charisma in its top players. This is an interesting read. In short we’re hoping for the best for the LPGA Championship and the LPGA Tour. It’s a great product and more fun than a barrel full of free putters to watch. We’re just not sure that Commissioner Bivens has figured out how to market it.